Richard Quinn’s multi-layered models walked the runway draped from head to foot in clashing scarf print pieces as the Queen, no stranger to a silk headscarf, sat on the Frow. Fear not though, because this trend is easier to wear and more contemporary than it sounds. For a subtle take on the look for beginners, simply add a printed silk scarf to your accessories collection this season and use it as an accent to add a little je ne sais quoi to your basics. Pick up a printed shirt dress for a versatile way to wear the trend with minimal effort and earn extra fashion brownie points by picking up a ready made pattern clash number with multiple patchwork scarf prints in one dress. Style Tip: Take a scarf print midi dress and simply add long boots, a camel coat or trench, then accessorise with gold jewellery and a block colour tote bag. 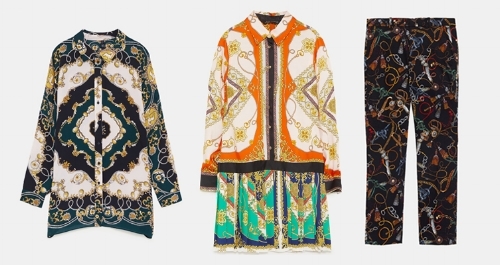 High street hits: Zara have nailed the scarf print trend this season with a multitude of silky chain print pieces from bomber jackets and blouses to mini and maxi dresses.